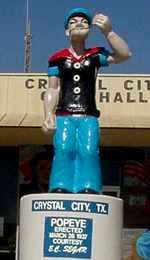 Two cities in the U.S. call themselves “Spinach Capital of the World.” One of them is Crystal City, TX. The other is Alma, AR. Now, I’ll give it to Crystal City. They erected a statue back in 1937 of the popular pipe-smoking sailor man, after the introduction of a Spinach Festival in their city. They have every right to the statue. Got no problem there. 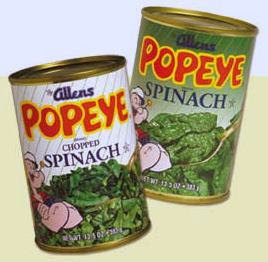 But when it comes to the Spinach Capital of the World, that has to go to Alma. The Allen Canning Company in town at one point was producing 65 percent of the world’s canned spinach. 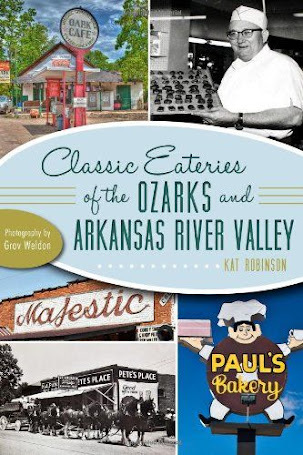 I could go into all of this extensively, but it’s covered well on Russ Johnson’s Arkansas Travelogue page. 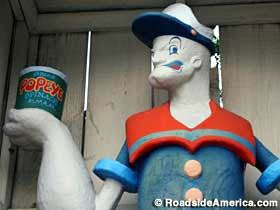 Anyway… it occurred to me recently that I have visited the old Popeye statue, the one that’s been in town since 1987... but I’ve never taken a photograph of it. Well, of course, this won’t do. So I rolled into town on an August morning and went looking for City Hall. The little statue (okay, it’s eight feet tall, but that comparatively small for a statue) sat across from City Hall for years. Instead, I saw the t-shirt adorned center of government, but no statue. Well, maybe I was wrong, maybe it was further down the road. So I headed a bit further along towards the high school. And I hit the brakes when I saw the park with its big cast iron gates. I pulled in. The imposing gates and path somehow reminded me of Graceland (though I know the driveway at Graceland is asphalt lined with bricks). Gardens lined a circle, and there were gazebos for cover. 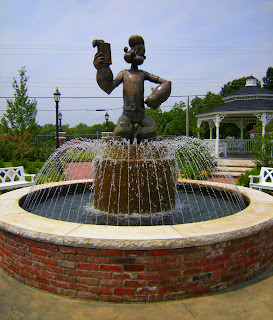 And in the center of it all, one large bronze tribute statue of Popeye in all its glory. The new statue hasn’t been up long. The park itself was dedicated in April 2007, and early this year a mural was painted on an adjoining wall, dated 1871 to 2009. It’s a cute little park with little photo opportunities everywhere and even a large gazebo I could easily imagine a small band performing on, or even being used as a place for nuptials. Flowers and shrubberies have been carefully laid out for the little oasis. 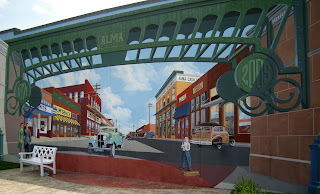 The mural depicts a composite of Fayetteville Avenue over the years -- with Murphy’s Café, Starbird’s Variety Store, Bowlin’s Grocery and Gayles Electric, E.L. McGehee’s and the Alma Cash Store. The view down Fayetteville Avenue is much different now. Most of the businesses have moved closer to the interstate, though the Allens Inc. (the name just recently changed from Allen Canning Company) is still hulking on the other side of the railroad tracks. 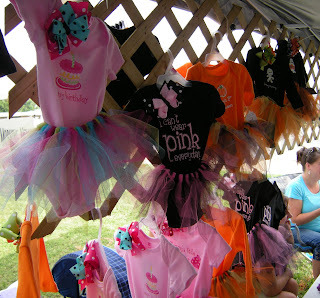 Perhaps the little attraction will draw more business in and help revitalize the area. 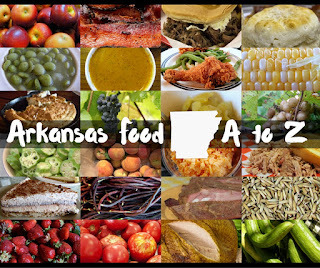 In case you were wondering, yes, Alma is home of an Arkansas food festival. 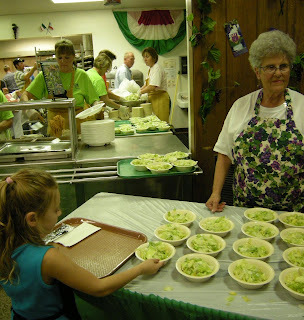 The Spinach Festival is held the third weekend of April each year, and there are contests there such as the Lil’ Mr & Miss Swee’ Pea Pageant. Of course, we’re all guilty of screwing up now and again. And I screwed up on this assignment. Because I forgot to take a photo of the water tower. Fortunately, others have… so you know what the World’s Largest Spinach Can looks like. Except it’s full of water. Yeah, something like that. 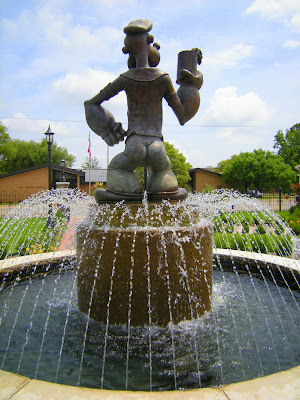 You’ll find the statue of Popeye in Alma. From Interstate 40, head south on Highway 162. It winds first to the left at the fork south of Highway 64, then right just before the canning plant. Cross the railroad tracks, and the park is just down a couple of blocks on the right. If you get to the high school, you’ve gone too far. Trying to figure out a good trip for your family? Check out the Greater Little Rock metropolitan area. There's a lot to do -- a lot of it free! Here's a sample itinerary you might consider. Day 1: Little Rock’s Riverfront. There’s a whole lot to see and do in a ten block span along the Arkansas river. Free parking is available off 2nd Street between Commerce and Sherman and under the I-30 River Bridge (between the Clinton Presidential Center and the Museum of Discovery). For the active family, there are plenty of sidewalks and paths to utilize; or, you can acquire a pass for the River Rail system ($2 for a day pass or $5 for a three day pass). Breakfast at the River Market Pavilion. Grab bagels at Andina’s or a hot sausage and egg breakfast at Shaka Smoke Lodge. On Tuesdays and Saturdays, the Farmer’s Market sells fresh produce, too. Fun to watch folks going about their day. 400 President Clinton Avenue. 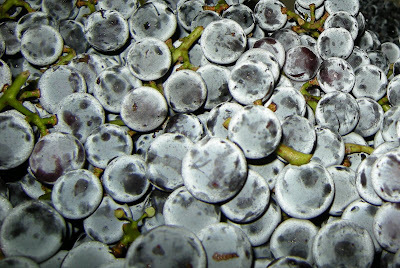 www.rivermarket.info. 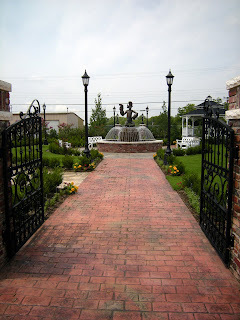 Step back in history with a visit to the Historic Arkansas Museum. 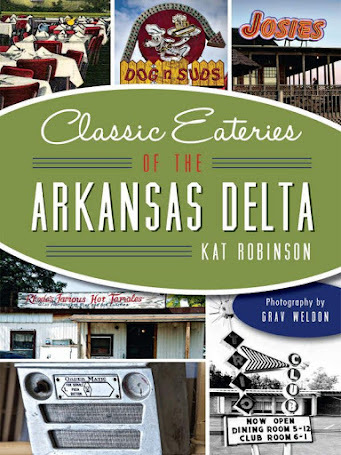 Guides in period clothing will usher you through Arkansas’ past, including several 19th century homes and businesses. 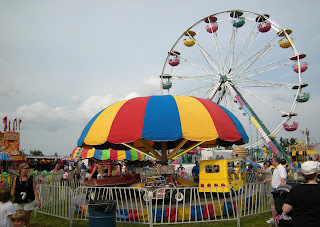 $2.50 for adults, $1 for children, open 9-5 weekdays and 1-5 Sundays. 200 East Third Street. (501) 324-9351. www.arkansashistory.com. 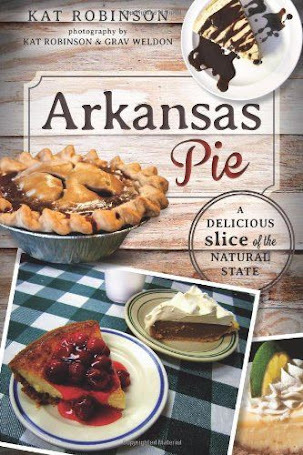 More Arkansas history can be discovered for free at the Old Statehouse Museum. This birthplace of Arkansas politics includes several fascinating permanent exhibits, such as the 1836 House of Representatives Chamber, a collection of gowns from the First Ladies of Arkansas, and a gallery on “First Families: The Mingling of Politics and Culture.” FREE, open 9-5 weekdays and 1-5 Sundays. 300 West Markham. 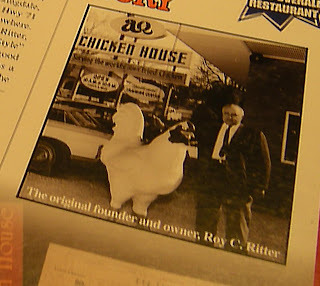 (501) 324-9685. www.oldstatehouse.com. 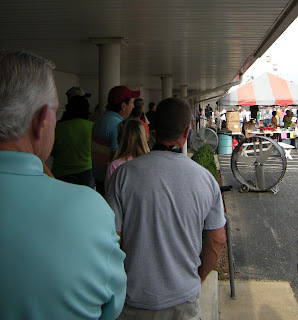 Another great free activity -- watching the Duck March. Visit the Peabody Hotel at 11 a.m. to watch the Duckmaster bring the famous Peabody Ducks down from the roof at the Peabody Hotel to their daily swim in the lobby. If you miss it, you can catch the Duck March in the evening, when the ducks return to their rooftop roosts. 3 Statehouse Plaza. 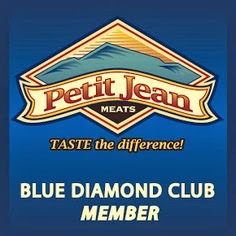 (501) 906-4000. www.peabodylittlerock.com. Enjoy a romp in Adventure Park at Riverfront Park, which houses an amazing playground that emphasizes climbing. Several climbing walls, chutes, slides, and tunnels are there for your exercise and amusement. Good place for photo ops -- and where you need to go to access the new Junction Bridge Pedestrian Walkway to North Little Rock. North from President Clinton Avenue at LaHarpe. Lunch at The Hop. This newly-relocated diner at Markham and Scott is a great place to catch burgers, fries, and all your traditional favorites. Be sure to grab a milkshake before you go. Open 7-6 Monday-Friday and 10-6 Saturday (closed Sunday). 201 East Markham. (501) 244-0975. In the afternoon -- check out another great free exhibit at the new Witts Stephens Nature Center on the riverfront. The brand new state of the art facility showcases nature and life along the Arkansas River. Open 8:30-4:30 Tuesday-Saturday and 1-4:30 Sundays (closed Monday). 602 President Clinton Avenue (access by Clinton Presidential Store). 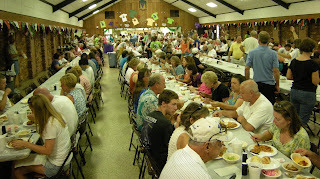 (501) 907-0636. www.centralarkansasnaturecenter.com. There’s tons of fun to be had at the Arkansas Museum of Discovery. Neat hands-on exhibits and historical presentations are aimed at the younger set. 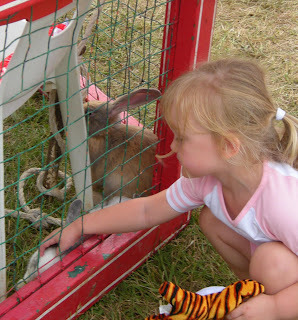 Insect-curious children will enjoy the Bug Zoo, younger children will dig the Room to Grow, and everyone loves the Imagination Station. Check for seasonal exhibitions and events, too. Open Monday-Saturday 9-5 and Sundays 1-5. 500 President Clinton Avenue Suite 100. (501) 396-7050. www.amod.org. Learn all about the 42nd President of the United States at the Clinton Presidential Center. In addition to exhibits featuring the Oval Office and the live and times of William Jefferson Clinton, traveling exhibitions offer unique chances to experience things such as Space: From the Moon to Mars in the summer of 2009. Open 9-5 Monday through Saturday and 1-5 on Sunday. 1200 President Clinton Avenue. (501) 374-4242. www.clintonpresidentialcenter.org. Dinner at The Flying Fish. 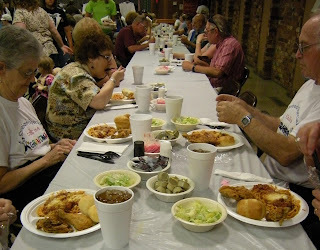 Fish, shrimp, oysters, and chicken served up with a variety of side items in a fun-and-fish filled atmosphere. Bring your own Big Mouth Billy Bass for the wall display and receive a basket of catfish. Open 11-10 Sunday-Thursday and 11-11 Friday and Saturday. 511 President Clinton Avenue. (501) 375-FISH. www.flyingfishinthe.net. After dinner on Friday and Saturday nights -- catch a show at the IMAX at the Aerospace Education Center. While you’re at it, check out the neat Arkansas Aviation Hall of Fame. Shows throughout the week daily; check the schedule. 3301 East Roosevelt Road. (501) 376-4629. www.aerospaced.org. Breakfast at Community Bakery. Bagels, croissants, doughnuts, and just about every favorite breakfast drink out there. A great place to find your early morning dining desire, along with free periodicals on all sorts of activities. Open 6 a.m. to 8 p.m. Monday-Thursday, 6 a.m.-10 p.m. Friday and Saturday, and 7 a.m.-8 p.m. Sunday. 1200 Main Street. 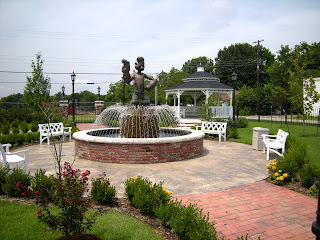 (501) 375-6408. www.communitybakery.com. Fine art meets fun at the Arkansas Arts Center. Not just your ordinary static place with art on the walls; the Arts Center also features classes for children, special events, and the Children’s Theater of Arkansas. Open Tuesday-Saturday 10-5 and Sundays 11-5. Closed Mondays. 501 East 9th Street. (501) 372-4000. www.arkarts.com. For kids who love the military, there’s the MacArthur Museum of Military History at MacArthur Park. Featuring extensive exhibits about World Wars I and II and the Korean War. Open Tuesday-Saturday 10-4 and Sunday 1-4. 503 East Ninth Street. (501) 376-4602. www.arkmilitaryheritage.com. Shopping and lunch in the Heights. Lots of great places for kid shopping, including Little Rock’s oldest family-run toy store, the Heights Toy Center. Make your own hand-painted ceramics at The Painted Pig. Pick up a good book at Wordsworth Books. Create your own backyard feeder at Wild Birds Unlimited, and more. Directory can be found at www.heightsshopping.com. Lunch at Za Za’s. This nouveau fun restaurant features gourmet pizzas and salads, plus Little Rock’s best gelato bar. Also a good place to consume Italian sodas and coffee drinks. Open Monday-Saturday 10:30 to 10:30, Sunday 11-7. 5600 Kavanaugh. (501) 661-9292. For "second dessert," try Cupcakes on Kavanaugh across the street. Fantastic, delicious cupcake creations made from farm-raised and organic ingredients. Organic milk and coffee are also on the menu. Open 11-5:30 Tuesday-Saturday. 5625 Kavanaugh. (501) 664-CAKE. www.eatacupcake.com. 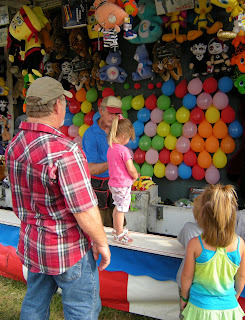 Head over to North Little Rock for an afternoon of fun. The Arkansas Sports Hall of Fame, tucked up underneath Verizon Arena, features exhibits and interactive productions about Arkansas’ legendary sports heroes, including John Daly, Jermain Taylor, Mark Martin, and Pat Summerall. 3 Arena Way. (501) 663-4328. www.arksportshalloffame.org. Then there’s the Arkansas Inland Maritime Museum. Tour the USS Razorback, a World War Two era submarine, and learn more about Arkansas’ maritime and naval traditions and history. Open Friday and Saturday 10-4:30 and Sunday 1-4:30. 120 Riverfront Park Drive. (501) 371-8320. www.aimm.museum. Consider a bike ride on the River Trail. You can rent a bike at River Trail Rentals in North Little Rock’s Riverfront Park, and ride all the way down to the Big Dam Bridge. Trails on either side of the river are fun to explore. River Trail Rentals is open seasonally. Call (501) 374-5505 or check out www.rivertrailrentals.com. During the late spring and summer, catch a game at Dickey-Stephens Ball Park. The brand new facility is home to the Arkansas Travelers. For the kids, there’s The Berm, a grassy area along the outfield where families can watch on blankets or towels. There’s also a playground. Check the schedule by calling (501) 664-7559 or checking out www.travs.com. Breakfast at the Ozark Mountain Smokehouse. Smoked meats and enormous omelets are featured on the menu. 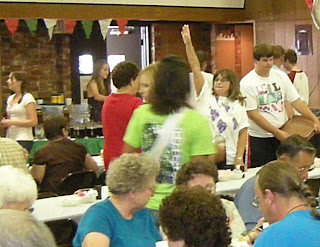 The country breakfast is considered by some to be the best in town. 201 Keightly Drive. (501) 665-7319. www.ozarkfamily.com. Looking for adventure? 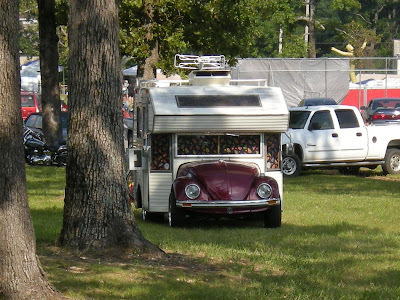 Head out to Pinnacle Mountain State Park. Various paths offer visitors the chance to climb the mountain, walk the base, and check out wildlife. An interactive nature center is a great stop for kids, and the nearby short trail offers gorgeous views of the Arkansas River Valley. 11901 Pinnacle Valley Road. (501) 868-5806. www.arkansasstateparks.com/pinnaclemountain. For younger folks, there’s The Wonder Place. This creative playspace for kids age eight and under focuses on activities that stimulate creativity and imagination. Enjoy a treehouse, play area, water table and air tubes. Admission is $7 per person. 10301 North Rodney Parham (in the Breckenridge Village Shopping Center), (501) 225-4050. www.thewonderplace.com. Lunch at Cheeburger Cheeburger. Design your own burger from a wide variety of choices. Doesn’t matter how many add-ons you choose, it’s all included in the price. Thick designer milkshakes are also on the menu. 11525 Cantrell Road (in the Pleasant Ridge Shopping Center). 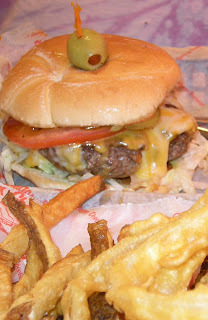 (501) 490-2433. www.cheeburger.com. Enjoy an afternoon at the Little Rock Zoo. Find out all about Naked Mole Rats, learn about the Black and White Rhinos, and discover the latest zoo friends, otters Kamili and Kapenzi. You can even dine at Café Africa. Open daily 9-5. 1 Jonesboro Drive. (501) 666-2406. www.littlerockzoo.com. Dinner at Purple Cow. Classic burgers, fries, dogs, and suds mark a great 50s style menu. 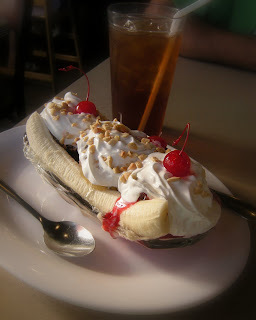 This is the place for your favorite fountain and ice cream drinks, including the quintessential banana split. Open daily. 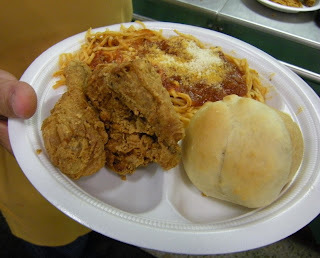 Two locations: 8026 Cantrell Road. (501) 221-3555 and 11602 Chenal Parkway. (501) 224-4433. www.purplecowlr.com.